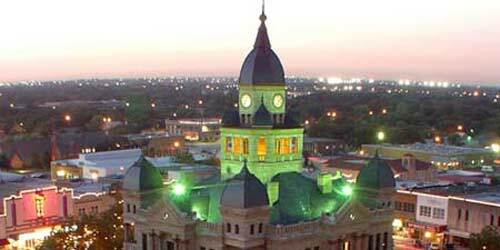 Denton is a city located in the north end of the Dallas-Fort Worth Metroplex in North Texas on Interstate 35. Denton is known for its active music life; the North Texas State Fair and Rodeo, Denton Arts and Jazz Festival, and 35 Denton Music Festival attract over 300,000 people to the city each year. Its diverse citizenry is represented by a nonpartisan city council and numerous county and state departments have offices in the city. With over 45,000 students enrolled at the two universities located within its city limits, Denton is often characterized as a college town. As a result of the universities' growth, educational services play a large role in the city's economy. Residents are served by the Denton County Transportation Authority, which provides commuter rail and bus service to the area.